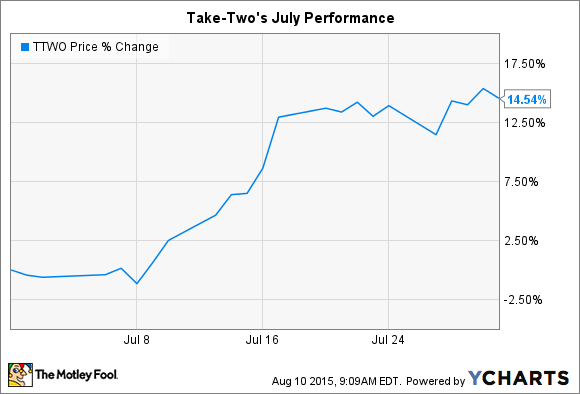 Will Take-Two Interactive Software Inc.'s Latest Earnings Report Add to July's 15% Stock Gain? Analysts see the company returning to profit as sales bounce 46% higher to $351 million. What: Video game publisher Take-Two Interactive Software (NASDAQ:TTWO) saw its stock jump 15% higher during the month of July, according to S&P Capital IQ data. The bounce put shares at a new all-time high, leaving Take-Two investors up 50% over just the last year. So what: With second-quarter earnings due out on the afternoon of Aug. 10, investors are betting that Take-Two can benefit from the same powerful trends that have lifted sales and profits at rivals Activision Blizzard and Electronic Arts. These game publishers far outweigh Take-Two in terms of market capitalization. But their latest results show that the industry is on a broad upswing that should help Take-Two's business as well. A banner next-generation console launch has built a huge installed base of gaming devices. And players are embracing digital content purchases, which is extending the productive life of hit video games and making the properties far more profitable for game developers. Activision and EA both logged record high second-quarter profit margins last week. And digital sales now account for more than half of these video game giants' businesses. Now what: Wall Street is expecting a similarly strong performance from Take-Two this quarter. Analysts see the publisher returning to profit as sales bounce 46% higher to $351 million. If it achieves that impressive growth, it will be mostly thanks to continued dominance of the blockbuster Grand Theft Auto V franchise. That title was released for the PC platform in April after originally launching for game consoles last year. But the franchise is still going strong: It's sitting in second place on the lucrative digital sales charts, behind only ATVI's Call of Duty: Advanced Warfare. As for the rest of 2015, Take-Two should see solid contributions from perennial hits including its NBA2K15, Civilization, and Borderlands franchises. But management demonstrated that they can also launch new intellectual properties, like this year's Evolve shooter, to further diversify the business.That improving game lineup has raised hopes that Take-Two can break out of its uneven earnings performance and start churning out steady annual profits just like EA and ATVI do.